You don’t even need to ask, we’ve got your back. That’s the essence of APEXA. We take care of monitoring compliance and sending you alerts so you can focus on other, more important things. “Everything stinks until its finished” Wisdom by the whimsical author Dr. Seuss who would have turned 115 this month. I like the simplicity of this quote which reminds us that new things feel like a challenge until you push through and experience the rewards. If you are onboarding this year and are thinking about how to prepare your organization, follow our content on change management and our feature this month on Five Ways to Boost Advisor Registrations. And remember to lean on us because it’s our job to make things stink less for you. Happy Birthday Dr. Seuss and happy reading to all of you. APEXA is scaling up to bring on up to 60 new MGAs and Carriers in 2019 as the industry moves toward submitting all new Advisor contracts through APEXA starting January 1st, 2020. Learn more about what’s to come by clicking here. "When you are named to the annual list of the 100 Most Innovative RegTech Companies in the World…it’s a good month. 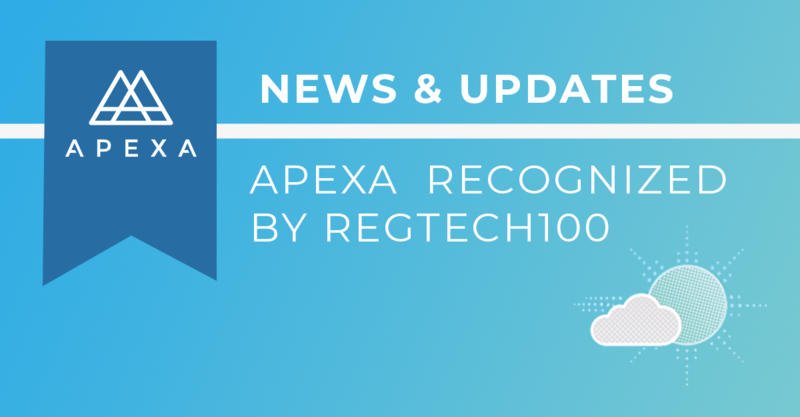 APEXA is honoured to be named to RegTech100 and proud to be making a difference in the Canadian Life insurance industry"
Recognizing pioneering companies transforming compliance, risk management, and cybersecurity. According to the regulatory technology (RegTech) industry, there has been unprecedented growth over the last two years as banks and financial institutions are challenged with the unrelenting pace of regulatory change across all jurisdictions. Specialist research firm, RegTech Analyst, reviews the world’s most innovative technology solution providers that address these regulatory issues and identifies the leading 100 companies in the RegTech space. "Fall is the perfect time to turn over a new leaf or at least brush up the existing one. If you need to start fresh or fine tune your digital marketing strategy, Mariah Clarkin shares three simple steps in Online Marketing Strategies for Advisors, so grab yourself a Pumpkin Spice Latte and take a breeze through our tips and trips from September." “Culture eats strategy for breakfast”. I love that quote attributed to management guru Peter Druker and ain’t that the truth? Apexa is built on a culture of innovation and this month we flexed our innovation muscle by expanding our skill set in Design Thinking methodology. Design Thinking is a simple concept with a focus on human centered design, but the brilliance comes in the way the method keeps our natural biases at bay, so the river of innovation can run right through. Check out the blog on our Design Thinking experience and if you ever want to have a riveting conversation on the benefits of this approach, lets grab a coffee and chat. Summer for me is about refreshing beverages, fresh veggies from the garden, and living as many hours as I can outdoors. While you think about your summer pleasures, take a moment to see what we’ve been up to in July. What makes APEXA unique? Our collaborative business model, which helped us grab first place at the ACORD InsurTech Innovation Challenge semi-finals in New York. Thanks for continuing to follow our journey as we redefine contracting and compliance for the Life Insurance industry.